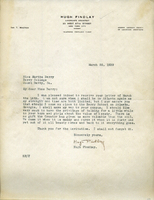 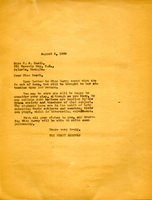 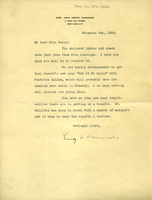 Response from Hugh Findlay to Martha berry about invitation to visit the campus in Atlanta Georgia to give a talk about his job to the kids. 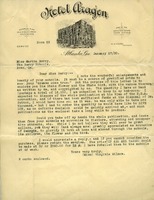 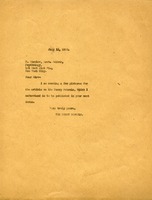 A letter informing Miss Heath that Martha Berry is out of town and will read her letter concerning her play when she returns. 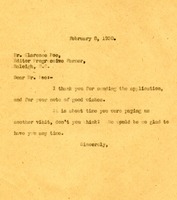 Mr. Hamilton informs Martha Berry that her letter to Mrs. Hamilton arrived, but that Mrs. Hamilton passed away the previous year. 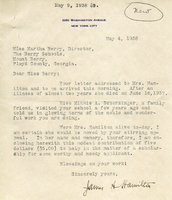 He tells her that a family friend visited Berry and was impressed by their work. 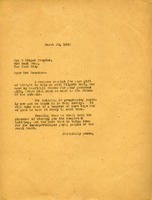 He encloses a $5 donation to the scholarship fund. 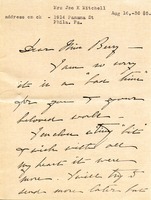 A thank you letter from Martha Berry to Clarence Poe regarding receipt of his application and note of good wishes. 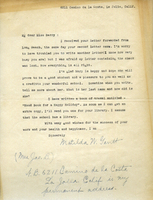 This is a letter written to Miss Berry from Mrs. Mitchell. 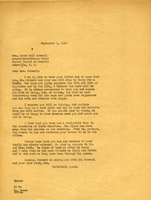 Mrs. Mitchell is sending her apologies to Miss Berry because she knows this is a tough time for her in her work, and she must have her hands full. 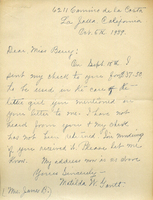 Mrs. Mitchell has enclosed a small amount of money and wishes she could help Miss Berry out more. 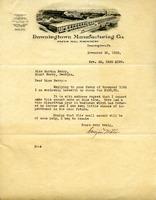 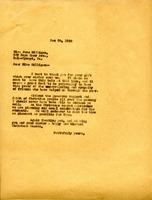 A letter to Miss Jane Milligan thanking her for the gift around the Christmas season.